This handcrafted adventure showcases India's classic highlights and hidden treasures. Guided through the eyes of local experts, you will uncover the best kept secrets of Delhi, Agra, Jaipur, Manvar, Jodhpur and Udaipur. On a variety of exclusive tours and activities, you are invited to experience the rich Indian culture in a way never before seen by most travelers. You are welcomed into a world of colorful wonders, where every building, every ruin and every street corner has a story to tell. India is an adventure for the senses. An enticing destination that keeps you captivated, from past to present, from run down to luxurious. Pack your bags and get ready to fall in love! This exclusive group adventure is scheduled from OCTOBER 5, 2018 to OCTOBER 16, 2018 with limited spaces available. Welcome to India! Upon arrival at Delhi's International Airport, clear Immigration and Customs formalities. A local representative will be waiting to greet you in the arrivals area, holding a lovely garland of marigold flowers. From the airport, you will be driven directly to your hotel, to enjoy the first night of your adventure amidst India's world of wonders! Following breakfast at your hotel, you will be met by your guide for a tour of Old and New Delhi. Old Delhi was once recognized as an ancient walled city. In 1650, Mughal Emperor Shah Jehan switched the Mughal capital from Agra to Delhi. Shah Jehan, who possessed an exquisite talent, especially in architecture, created the seventh city and in the process brought about Delhi's glorious renaissance. Start today's excursion with a cycle rickshaw ride through Old Delhi. On this journey, you will have the chance to see the Red Fort and the Palace of the Mughal Empire. The fort is Shah Jehan's symbol of power and elegance, built behind red sandstone walls. It's main gate (Lahore Gate) faces Chandni Chowk, the perpetually congested avenue heading west from the Red Fort. It is filled with twisting lanes, small streets and crowded bazaars. If you peer through a portico, you may even catch a glimpse of a man getting shaved, silver being weighed, or any other conceivable form of intense commerce. You may also visit Raj Ghat, the memorial site of the Mahatma Gandhi, Jama Masjid, the largest mosque in India, and Chandni Chowk, the colorful market of the old city. Your senses will come alive, with the exotic spices, culinary delicacies and bustling activity. Following your rickshaw ride, you will continue on to New Delhi for a contrasting perspective. New Delhi was designed and built by the British in the 1920's. It is a city of wide boulevards, impressive government buildings, green parks and gardens. In 1911, King George V announced the transfer of the capital from Calcutta to Delhi. The King's architects set the design in motion and began the construction of Delhi's eighth city - New Delhi. They designed an "Imperial City", boating palatial-sized buildings set amid broad tree-lined avenues, and punctuated by Mughal style gardens, complete with fountains and shallow pools. During the exploration, you will visit two monuments from Delhi's past, Qutub Minar and Humayun's Tomb. The tomb took eight years to complete and is regarded as an example of the early Mughal architecture. Your drive will also take you along the ceremonial avenue, Rajpath, past the imposing India Gate. Nestled in the center of New Delhi, erupts this 42 m high India Gate, an archway in the middle of a crossroad. The President House and the Parliament House, a symbol of Indian democracy, will also be seen during your adventure. As your exploration continues from site to site, you guide will teach you about the rich history and fascinating past. After breakfast at your hotel this morning, you will be met by your driver and taken on the 4 hour transfer to Agra. Sit back, relax and enjoy the ride! Once you have reached your new hotel in Agra, you can check into your room and freshen up before your next excursion. This afternoon, you can look forward to visiting the iconic Taj Mahal. That magnificent monument of love – The Taj Mahal, was built by an emperor in memory of his beloved queen. Construction of the Taj Mahal began in 1631, and is believed to have taken 22 years to complete, with over 20,000 craftsmen working round the clock. The design and construction is said to be that of the legendary architect, Ustad Ahamad Lahori. Legend has it, that once construction was completed, Shah Jehan had Lahori's hands cut off and blinded, so he would never be able to duplicate the structure. What makes the Taj Mahal unique is its perfect proportions, distinct femininity, medium of construction and ornamentation. Its marble exterior reflects rose and golden tints at sunrise and sunset, while it remains a dazzling white during the day. After your enchanting experience at the Taj Mahal, you will make your way to the fascinating Agra Fort! Also known as Lal Qila, Fort Rouge and Red Fort of Agra, the Fort is about 2.5 kilometers northwest of its much more famous sister monument, the Taj Mahal. The Fort can be accurately described as a walled palatial city. During a time when the country was governed from this royal residence, the great Mughals Babur, Humayun, Akbar, Jehangir, Shah Jahan and Aurangzeb once lived here. It used to contain the largest state treasury, visited by foreign ambassadors, travelers and the highest dignitaries from all over the world, who participated in building India's history. At the time of the Mughals in the 16th and 17th centuries, Agra was the capital of the grand Mughal Empire. During this period, the city transformed into a leading center of art, science, commerce and culture. The short golden age of Agra came to an end with the 17th century reign of Shah Jehan, the mastermind of the Taj Mahal. Its ancient beauty and striking history is still just as impressive today. Wake up first thing this morning, in time to experience sunrise at the magnificent Taj Mahal. Early this morning take a special look at the Taj from the other side of the River. A visit to Mehtab Bagh gives you a truly unique perspective as this is the one of the very few spots where the Taj Mahal, the Mosque and the Guest House can all be seen from one point. Emperor Shahjahan transformed a 25-acre patch into a magnificent four-quartered garden that blended perfectly with the sanctified complex of the Taj. This pleasure garden was called Mehtab Bagh or moonlit garden, profuse with white plaster pathways, breezy pavilions, pools and fountains. Watching this enticing beauty come to life, offers a moment you won't ever forget. After admiring the warm sunlight coat the exterior, you will return to your hotel for breakfast. Once you have checked out of your hotel in Agra, you will embark on the 5 hour drive to Jaipur. In order to make the most of this journey, you will stop for an exploration of Fatehpur Sikri, which is located about 1 hour outside of Agra. Fatehpur Sikri was built by the Mughal Emperor Akbar. The architectural grandeur of this deserted city simply cannot be described in words and one can only experience the aura of it's magnificent edifices, by seeing them. In the palace complex, you will find a huge rectangular walled-in courtyard, where petitions were heard, proclamations were made, ambassadors received and entertainment programs held. Ponder the mysterious desertion of this capital city that was dramatically abandoned only a few years after it was built. It was a veritable fairytale city and its 'ruins' are still in pristine condition. After your discovery of this beautiful ancient city, you will continue the drive to Jaipur, where a relaxing evening at your leisure awaits. Following breakfast at the hotel, you will proceed on a tour of the inspiring Amber Fort. Amber Fort is a marvelous example of Rajput architecture, with its stunning terraces and ramparts reflected in the glassy Maota Lake below. The interior of the fort features a variety of royal halls, decorated with intricate ivory, mirror and glass. Later on, your day continues with an afternoon city tour of Jaipur. Your guide will take you to visit the City Palace Museum, where you can admire an impressive blend of traditional Rajasthani and Mughal Art. The museum features a dazzling collection of robes from royal princes, beautiful carpets, an armory of old weapons and intricate miniature paintings. You will also explore the awe inspiring Jantar Mantar, an accurate observatory built in 1726 AD. From there, head to the Palace of Winds, a five storied wonder with a spectacular pyramidal facade and overhanging windows that boast latticed screens, domes and spires. Although most tourists visit Jaipur to view its grand monuments, there are just as many travelers who come to shop. And indeed a shopper’s paradise it is! The list of things available in Jaipur is truly endless, but the most popular items include jewelry, textiles, saris and goods made of marble, wood, stone, lac, clay, metal and leather. This city has long been a traditional center for the finest of jewelry, decorated with both precious and semi precious stones. In fact, Jaipur is world renowned for its diamond and emerald cutting. Apart from jewelry, handicrafts like paper mache and carved furniture are also extremely popular. You could spend hours admiring all that the bustling market stalls have to offer. Enjoy one last breakfast in Jaipur, before you are picked up for the 6 - 7 hours journey to Manvar. Driving long distances in India offers the chance to admire more of the country than you would normally ever see. So, savor the scenery as you cruise through the changing landscapes. Upon arrival you'll check to your lovely resort. 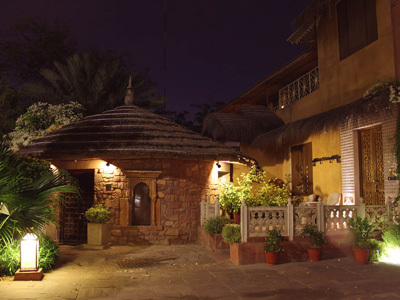 Located in the heart of the sand dune region of Rajasthan between the ancient cities of Jodhpur, Jaisalmer, the Resort is a hidden gem – very quaint and pleasant, a green oasis in the desert – designed and built in the style of a village settlement against the backdrop of a desert landscape. An oasis in barren lands which weaves technology and comfort to a contemporary traveler in this rustic expression. Providing warm and comfortable interiors in contrast to the earthy and rugged exteriors which has led to the blossoming of a boutique environment which has retained the original beauty and royalty of Rajasthan in its red and beige stone structure. This morning you will embark on a jeep safari to explore the surrounding region. A Jeep Safari through the Sand Dunes of Rajasthan is the perfect way to explore the true charm of the sleeping villages and the rustic barren trail of Thar Desert. The journey takes you through the well-kept secrets of the desert - from nocturnal shades of the sun to ever changing colors of the vast sea of shimmering sand and barren land..Giving you a peek into the rural Rajasthan, the safari takes you back to the bygone era of the state....As you drive through far and distant villages, be amazed by the life style of locals, see mud huts and stroll through narrow lanes, get to see Antelopes , deer, desert fox. Let the adrenaline levels flow as you sit in an open jeep and the driver drives it through the dips. After checking into your luxury desert camp this afternoon, you'll embark on a camel safari. The Thar of Rajasthan can be explored using camels which is an experience one must have in a lifetime. Camel safaris are certainly the ideal way to spend time exploring the rustic and royal Rajasthan. It is an adventure, which takes you through the vast golden dunes of the Thar providing a glimpse of the desert lifestyle. Upon returning to camp, freshen up before enjoying a magical dinner under the shining stars. The evening is set against the backdrop of mesmerizing folk singers and graceful dancers. The food prepared on site is glorious, the experience as majestic as music floats and the stars bear down on you, a night like this is an experience that's unmatched. Enjoy one last breakfast in Manvar, before you are picked up for the 2 hour journey to Jodhpur. Upon arrival in Jodhpur's sea of blue buildings, you can check into your hotel and get ready for your afternoon guided tour of this magical city. This afternoon, head out on a city tour of Jodhpur. You will have the opportunity to visit the famous red sandstone fort, built five centuries ago and which contains the handsome Maharajah’s palace. Admire the Mandore Gardens. You will then be returned to your hotel to enjoy the remainder of the evening at your leisure. 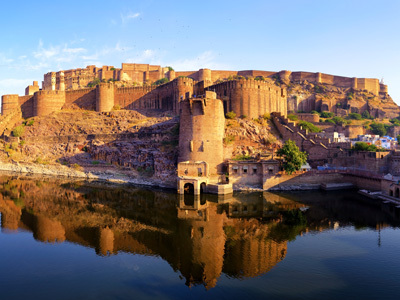 Among Rajasthan's many princely settlements, Jodhpur is one of the most distinctive. This five hundred year old settlement was the headquarters of the Rathore Rajputs celebrated for their tales of daring. Without any surprise, this charming state is also referred as "The Blue City." Founded in 1459, it is the oldest of Rajputana's great cities. Jodha's Jodhpur preceded Bika's Bikaner by thirty years, Udai Singh's Udaipur by more than a hundred, and Jai Singh's Jaipur by nearly three centuries! This morning, you will proceed on a Bishnoi Village Safari. If you want to experience tribal India, Jodhpur Guda Bishnoi Village is the place for you! It is approximately 25 kms from the main city of Jodhpur. The village is filled with scenic beauty, spotted with stunning Khejri trees and deer. Also in the village is the Guda Bishnoi Lake, an artificial lake, great for incredible photo shots. During this excursion, you will get to truly appreciate the exotic wildlife and nature of India, as well as be immersed in the village culture. The Bishnoi community are staunch worshipers of nature in all it's forms, especially the sanctity of plant and animal life. They even pray to the green trees and animals that inhabit their land. In a world of exploitation everywhere, they make every effort to conserve our environment. Enjoy the remainder of the afternoon at your leisure. After breakfast in Jodhpur this morning, you will continue on the next leg of your adventure. The 5 hour journey to Udaipur will include a stop to explore the fascinating Ranakpur Temples. The Temples at Ranakpur are over 500 years old, although impressively well preserved. No other place in Rajasthan has the same ambiance and setting as that of Ranakpur, whose beauty is especially emphasized by its isolation. The temples are quite unique in both their style and design. The ceilings are carved with fine, lace-like foliate scrollwork and geometric patterns that are truly mesmerizing. The domes are carved in concentric bands and the brackets connecting the base of the dome with the top are covered with figures of deities. Make sure to have your camera, as the photo opportunities are limitless. After your interesting temple discovery, you will continue the transfer to your hotel in Udaipur, where you can spend a relaxing evening as you wish. Dotted with marble palaces, hibiscus laden gardens and fountain pavilions, Udaipur appeals to the imagination of poets and painters, travelers and writers, like no other city in India. The city's inherent romance and its remarkable past, continues to captivate the visitors today. Known as, the City of Dawn, Udaipur looms up like a vision in white. Surrounded by hills and mountains and set on the edge of three lakes, the landscape is truly enchanting. This morning, you will be taken on a city tour of Udaipur, beginning with the City Palace Museum. The extravagant rooms here are not a sight to be missed. The grandeur and intricacy of the granite, marble and mosaic displays, can be admired through the sparkling white balconies and windows, ornate arches and magnificent octagonal towers. Next, you will make your way to Jagdish Temple, built back in 1651 AD, before your final stop at Sahelion Ki Bari. This spectacular garden displays the unique lifestyle of the royal ladies, who once lived in the palaces. Later this afternoon, you can look forward to a relaxing boat cruise on the beautiful Lake Pichola. Jagmandir Palace is a fascinating island palace that sits on the lake. The banks of the lake will likely feature a glimpse of the daily bathing and laundry that takes place here. Looking across the lake, to marvel at the city skyline and its great palace rising up behind the island palace, is a scene of rare beauty. Before your tour is over, you will also have some time to spend in the bustling market that sprawls behind the City Palace Complex. New Delhi is a city of history and legend. Not far from Agra – the site of the world’s most beautiful tribute to love, the Taj Mahal – and surrounded by forests with 5,000-year-old stone temples still intact, the city is home to the famed Red Fort Palace and the Yamuna, one of the most revered rivers in Hinduism. 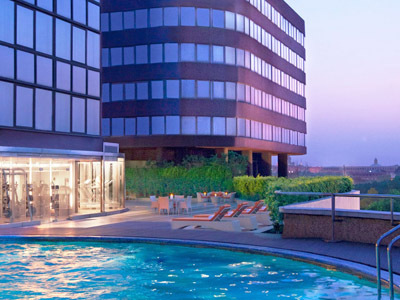 Le Méridien New Delhi is situated two kilometers from Rashtrapati Bhawan – the home of the President of India, the Presidential Palace, Parliament House, and Connaught Place. Our city center hotel is set amidst the most alluring shopping and entertainment districts in New Delhi. Experience the finest luxury hotel in Jaipur - ITC Rajputana, one of the best accommodation in the city with a host of comforts and services in settings that reflect the spirit of Rajasthan and its royalty. Just 15 kilometres from the airport and half a kilometre from the city center, the regal-influenced design and gardens echo the city’s history. Retreat to one of the 218 guestrooms and suites equipped with modern amenities. The restaurants offer tastes from around the globe, designed along the lines of traditional havelis, this leisure hotel in Jaipur has its own definition of space and splendor. Samsara is an alluring oasis amidst the endless dunes of the Thar. Beautifully landscaped exteriors compliment creative interiors. 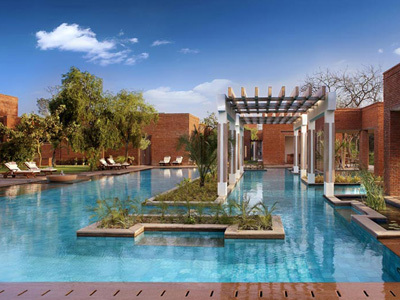 Carefully laid out water bodies of moats and fountains, around the property provide that soothing ambiance for a perfect get-away from the pandemonium of the city. Offering a host of services in an eclectic mix of rustic and modern aesthetic makes Samsara an ideal background for nuptials, official retreats and group holidays. Or we think, simply a great place to write that book that's hidden inside of you. The mysterious desert is an idyllic backdrop for magical evenings. Dinner under the stars, on the dunes set among hundreds of flickering lanterns accompanied by the evening entertainment of narratives by the local bards and folk dancers leave you mesmerized and wanting more. The camp features 21 luxury tents, en-suite bathrooms, dining tent, bonfire and evening entertainment. Amidst the wilderness, surrounded by the dunes of the Thar - the luxury tents are a sight to behold. Vibrant block-printed interiors complimented by carefully designed and locally crafted furniture and rugs accentuate the rich heritage of Rajasthan. All tents come with En suite bathrooms that have been designed for uttermost comfort using high end hardware accessories. Fit for a royal entourage against the backdrop of the setting sun with crackling log fires, the desert camp is truly picture perfect! Built at the turn of the last century, this stately home served as a residence that attracted Princes and statesmen, artists and hunters, an electric mix of the interesting & the mundane – all drawn to its warmth and hospitality. The Ajit Bhawan offers you Old World elegance, with the modern comforts of a Classic heritage hotel and the essence of being a guest of the Maharaja’s family. It is centrally located and very near to the world famous Umaid Bhawan Palace. Just 3 kms from the airport and railway station. Set in forty three acres of lush green landscaping, Trident, Udaipur is located on the banks of the picturesque Pichola Lake and is ten minutes drive from the city centre. The rooms at the Trident, Udaipur are furnished in shades of beige and light cream and the architecture reflects the ancient heritage of Udaipur. The hotel provides a perfect base to explore the fabled city of Udaipur, acclaimed worldwide for its beautiful lakes, medieval palaces and colorful bazaars.